Not to be confused with Baltic states. For other uses, see Baltic (disambiguation). The first to name it the Baltic Sea ("Mare Balticum") was eleventh century German chronicler Adam of Bremen. 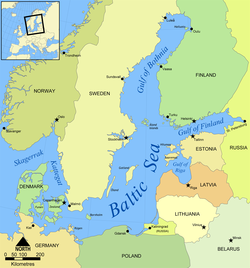 The countries that have shorelines along the Baltic Sea: Denmark, Estonia, Latvia, Finland, Germany, Lithuania, Poland, Russia, and Sweden. The group of countries presently referred to by the shorthand Baltic states: Estonia, Latvia, and Lithuania. Estonia, Latvia, Lithuania and Kaliningrad Oblast of Russia, exclaved from the remainder of Russia. Historic East Prussia and the historical lands of Livonia, Courland and Estonia (Swedish Estonia and Russian Estonia). The former Baltic governorates of Imperial Russia: Today's Estonia and Latvia (excluding parts of modern Eastern Latvia that were part of Vitebsk Governorate). The countries on the historical British trade route through the Baltic Sea, i.e. including the Scandinavian Peninsula (Sweden and Norway). The Council of the Baltic Sea States, comprised by the countries with shorelines along the Baltic Sea, in addition to Norway, Iceland and the rest of European Union. The islands of the Euroregion B7 Baltic Islands Network, which includes the islands and archipelagos Åland (autonomous), Bornholm (Denmark), Gotland (Sweden), Hiiumaa (Estonia), Öland (Sweden), Rügen (Germany), and Saaremaa (Estonia). On historic Scandinavian and German maps, the Balticum sometimes includes only the historically or culturally German-dominated lands, or provinces, of Estonia, Livonia, Courland and Latgale (corresponding to modern Estonia and Latvia), as well as sometimes Pomerania, Kashubia and East Prussia, while the historically less-Germanized Lithuania is occasionally excluded. Wikimedia Commons has media related to Baltic region. The Baltic University Programme - a University network focused on a sustainable development in the Baltic Sea region.